Times are shown in UTC (GMT). Local time in Laos is UTC + 7 hours. Frequencies shown like this: 88.0 are as announced, listed or reported and not yet confirmed. The national language in Laos is Lao (Laotian), but Lao radio stations also broadcast in Hmong, Khmu and other languages. INACTIVE on this frequency since mid-2000. Announced FM frequency is 103 MHz. FM frequency apparently off air, Feb 2014. 2200-0230v, 0530-0802v, 0900-1630 in Lao, except Hmong / Khmu 2200-2300, 0600-0800, Khmer 1330-1400, Chinese 1400-1430, English 1430-1500, French 1500-1530, Thai 1530-1600, Vietnamese 1600-1630. Reactivated with occasional tests, Jul-Sep 2001 and regularly carried International Service 2330-2400 Vietnamese, 0000-0030 Khmer, 0500-0530 Thai, 0530-0600 French, 0600-0630 English, and 1130-1200 Thai, 1200-1230 Vietnamese, 1230-1300 Khmer, 1300-1330 French, 1330-1400 English. 0300-1530 in Chinese, English & Lao. 'Date' indicates the month and year when the status of the frequency was most recently confirmed. Entries with no date given are listed or reported frequencies and are not yet confirmed. Relay stations are reported to be in planned in a number of other locations, details not yet available. Apparently off air, Feb 2014. 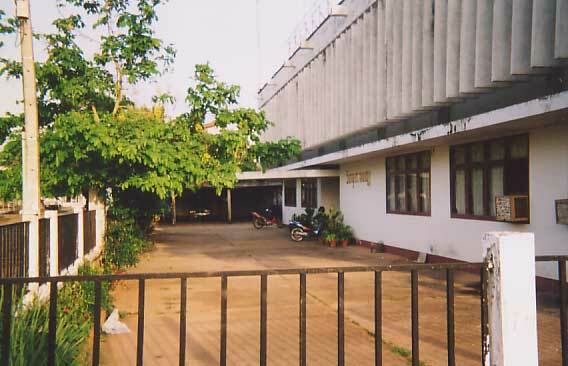 The Headquarters of Lao National Radio in Vientiane.